For 2012, Weleda have created this fantastic limited edition set of five mini versions of their best selling pampering body washes. These creamy body washes as multi-purpose products, making them great for travelling, as not only do they act as a body wash to cleanse your skin but they also act as an in shower body moisturiser too. Not only are they great for travelling but they’re also a great way to try out the product and it’s different fragrances before committing to buying the full size body wash. Each tube is 20ml full of product so there’s more than enough for 3 showers each so plenty of time to make your mind up on which is your favourite! All of the body washes are fairly thick and creamy in consistency. Not only do they clean your skin thoroughly but they also moisturise the skin, leaving it feeling soft and clean, without tightening the skin and leaving it squeaky which I hate. The fragrance of all of these products lingers on your skin afterwards as well as the softened feeling. Each of the 5 body washes has a different scent and contains a different lead plant so they all have slightly different benefits but they’re all packed full of a cleansing base made of sugar, coconut and rich anti-oxidant sesame oil to hydrate and cleanse the skin. The pack contains a body wash in citrus, wild rose, pomegranate, sea buckthorn and lavender. All of which have a powerful and natural scent. Nothing smells artificial about them in the slightest. I first tried one of the Weleda Creamy Body Washes when I tested out their Summer Travel Kit which contains all the essentials you’ll need for a trip away at home or abroad, including a 20ml tube of the Citrus Creamy Body Wash. I’m so happy that this pack contains another one of these as it smells amazing and really wakes you up if you use it in your morning shower. The citrus fragrance gives you a right kick; it’s invigorating and refreshing, particularly if you use it after a warm night when the air is too stuffy and hot. This one is ideal for skin that is dry or stressed as it contains organic musk rose oil to nourish the skin and it is rich in essential fatty acids to deeply moisturise and care for drier skin types. This one really softens the skin and makes it feel hydrated although it’s not my favourite scent as I’m not a lover of rose fragrances. This body wash is perfect to use at night time as it contains pure lavender essential oil which relaxes your body and makes you feel sleepy. Many lavender products are targeted for use in the bath while you soak but this body wash relaxes you just the same if you’re using it in the shower as it is so fragrant and fills the shower with the scent of lavender. If you’re using it in the bath, I recommend dampening your skin, smoothing this on and soaking for a few minutes before washing it off, for the ultimate body wash relaxing treat. I’ll be the first to admit that I haven’t a clue what sea buckthorn is but it certainly smells pretty, very much like orange and ever so slightly like a liquor. This body wash contains the powerful regenerating pro-vitamin A and vitamin E to nourish and restore the skin. 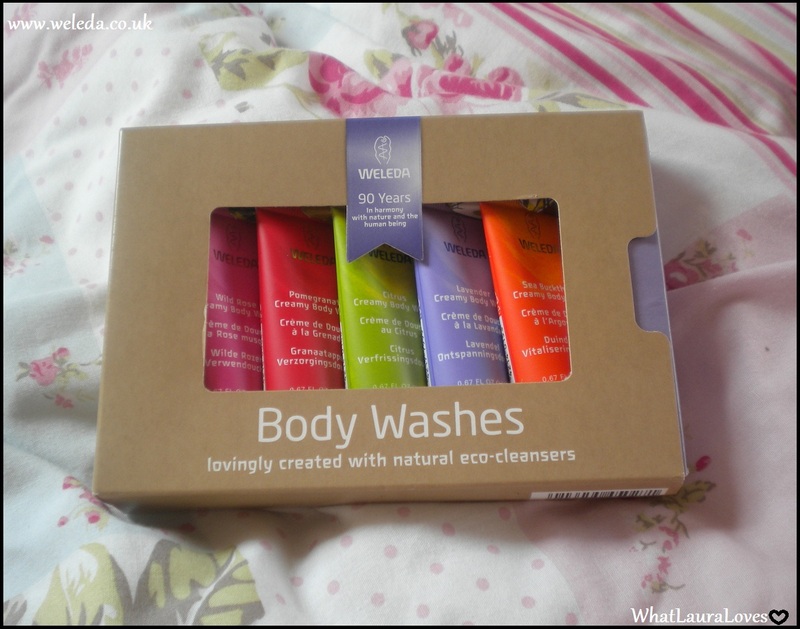 The Weleda Mini Body Wash Pack is available online here for £9.95 and you can also check out the main Weleda website here where you can find the full size versions of these minis and the other great products that they do. 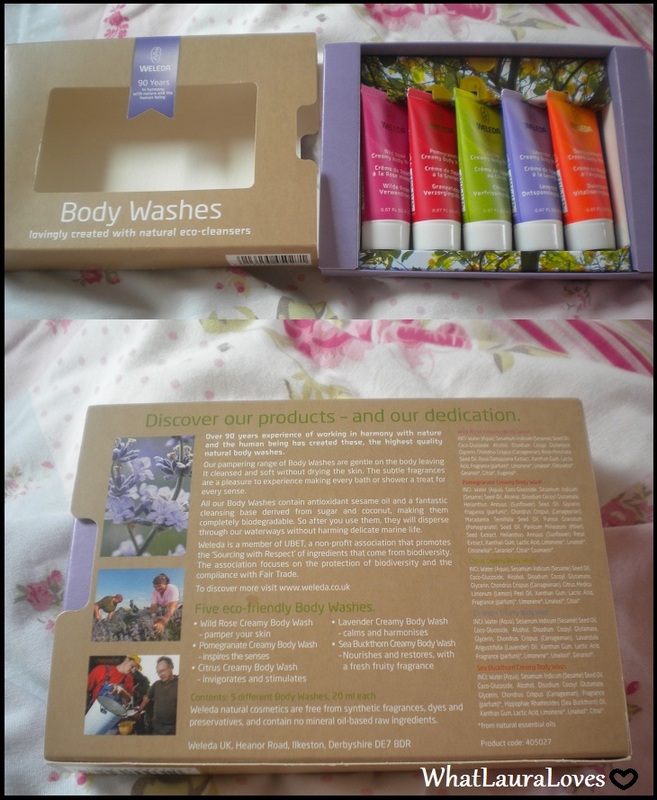 The Mini Body Wash Pack is not only great for travelling and for trying out the scents before you buy the full size but it would make a great gift for someone too. 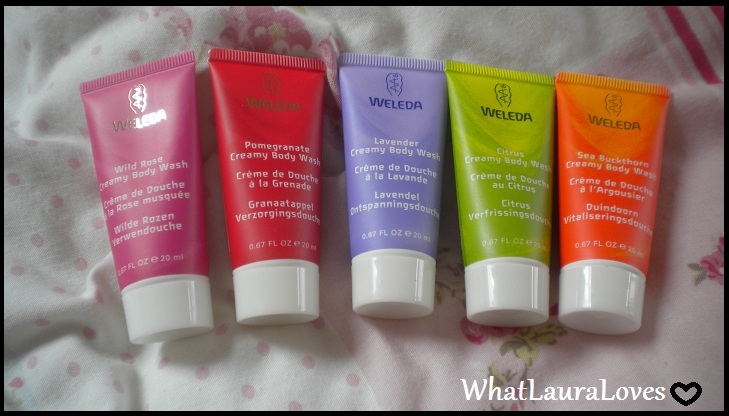 Have you tried any products from Weleda? What is your favourite scent? I have been using the citrus one for ages and would not swap for any other shower product. I've just discovered your blog by following links from one blog to another. I'd never find my way back to where I started if my life depended on it! I'm glad I got lost in the maze because it led me here. Lovely little blog. Hi! I liked your blog, it looks interesting! I offer you my sincere friendship!=)Please, follow me on Bloglovin: Kisses From Europe I will follow you via Bloglovin too;) Let's support each other! ^^Love&kiss!